We have begun a programme of long overdue carpet restoration as the many years of wear and tear is beginning to take its toll and replacing the carpets would be extremely costly. The carpets all date from the second half of the nineteenth century and are mainly Persian in origin. Our first two carpets have been away for the past two months on a long journey to Gloucestershire. 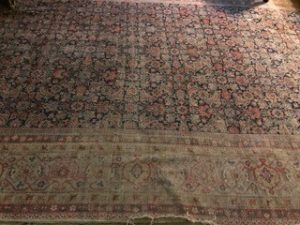 We have been delighted to discover Simon Knight and his team at Cotswold Oriental Rugs, who specialise in the restoration and conservation of historic carpets. He not only has come highly recommended, but the work he has done is exemplary. His workshops are almost unique in that they can wash and restore carpets of very large sizes; giving them a full immersion wash without having to fold them. This lessens the chance of any damage and the carpets can be worked on fully opened in the workshop. The carpets first have all the historic dust removed and then they are soaked in the washroom. The back and the front are then washed using organic detergents that are ph neutral so that the natural dyes are not affected. The carpets are then dried in the drying room using gentle heat and dehumidifiers. A large carpet can be dried in under 24 hours. After washing, up to three experienced Persian restorers worked on the carpets for 2 months. The sides were re-woven and rebound, the ragged ends were re-woven and secured. All the small holes and heavily worn areas were re-woven and the wools used were naturally dyed to colour match the original. Any historic old repairs were left in place so that the history of each carpet is retained. 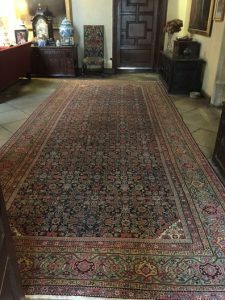 We have two more carpets that will be restored in the next year and we hope that our visitors will love walking on our newly returned carpets. They will certainly enjoy looking at them with their jewel like colours. We will be open this Sunday, 29th April from 12pm until 5pm, with the House open from 2pm. For further information on our opening times for the 2018 season click here.